- Become a Good and Trustworthy Reiki teacher with Aschimas high intuition and help to give you empowering and teachings to become self assure with giving all reiki attunements and teach out the Reiki in a beautiful way that is also from your knowing/intuition. - You can construct your own material during the course with Aschimas support and awakened senses. You will receive personal guiding while beginning to give a reiki student initiations and course material. Also help how to be in a positive teacher role that empowers the reiki student to feel same worth and empowering their intuitive scills and healing abilities. After the course you will receive a Certificate as a Reiki Teacher. 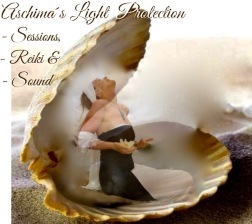 Aschima gives teachings how to go out of the Ego, get to know Universal love and freedom while teaching reiki. If you have the intention to become a Master of Universal consciousness, during the course - Aschima will support you! Aschimas Beautiful Courses all support Uniqueness - Everyone is UNIQUE - When we conform into a collective way to teach we will fail to receive everyones unique gifts and Powers on earth.